Here is another little tweak for The Archive using Keyboard Maestro. It is a slight variation of the workflow described in this post. Use case: going "software agnostic" almost certainly results in the use of different tools to work with your notes. I know, you could discuss that matter philosophically, but down on earth I love using (to name a few) iThoughts for brainstorming oder 2Do for task management. Linking back from tool x to note y can become more complex. Fortunately, The Archive provides a URL scheme to insert links that point to your notes (details are described here). The logic behind this macro is described in the other post. It searches your archive folder and saves a list of file names for later use. In modification to the other post, the "collect part" now gets it's own macro. 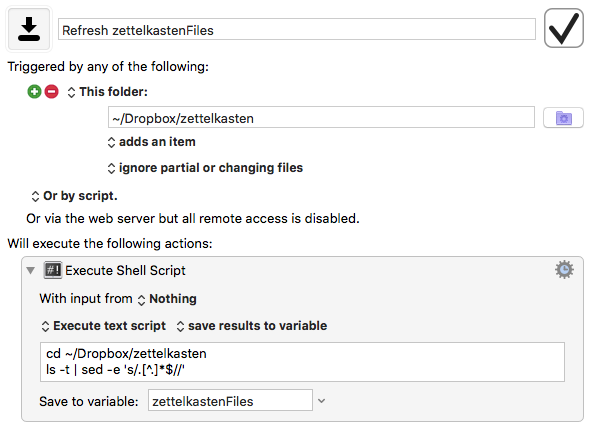 The benefit is, that you can use the resulting list (saved in the variable zettelkastenFiles) in different macros. The macro updates the list every time a new file is added to the archive. Don't forget to adjust the two file paths to match your archive location. Again, the logic is similar to the macro in the other post. It uses the saved collection to let you choose a file name (step 1). 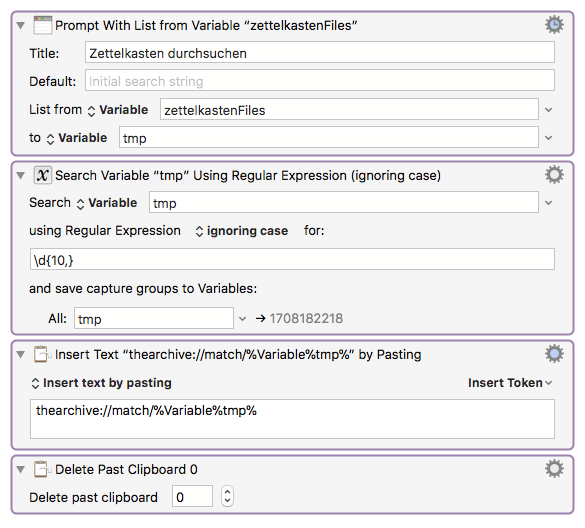 It extracts the UID (10 or more consecutive numbers in the file name, step 2) and inserts a URL in the form of thearchive://match/1108160947 (step 3). Again, very impressive work I think @Eurobubba will like this for his external link needs, too. Yep, I'm using all of @kaidoh 's KM macros for The Archive.